As world’s biggest Scotch whisky business Diageo announces a turnaround in global sales, it isn’t just the marquee name of Johnnie Walker that’s behind the resurgence, as Richard Woodard discovers. Last week’s set of company results from Diageo, the world’s biggest Scotch whisky business, offered clear evidence of the recovery of Scotch sales around the globe. The company sold roughly £3 billion-worth of Scotch whisky in the year to the end of June 2017 – compared to sales of just over £2.5bn during the previous 12 months. That reported revenue increase of 18% is somewhat artificial, given the plummeting value of the pound following the Brexit vote just over a year ago – in real terms, the sales rise was just under 5%. Nonetheless, that (and a volume increase of 4%) represents an impressive return to form 12 months after the company identified ‘Global Growth of Scotch’ as one of its three key focus areas for the year ahead. Last year, volumes fell 3% and revenues were flat. What’s driving this recovery? We’ve identified six factors that underpin Diageo’s recent Scotch whisky performance. Scotch whisky accounts for 25% of Diageo’s revenues, and Johnnie Walker has a 55% share of the company’s Scotch whisky sales – so there’s no escaping the vital importance of the world’s best-selling Scotch brand to the business. Walker’s recovery (volumes up 4%, revenues up 6%) mirrors that of the category as a whole – hardly surprising when you consider the blend’s global presence. Over the past year, it has become more popular in markets as diverse as the US, Mexico, Spain, Colombia and China – and its biggest-selling expression, Red Label, saw revenues increase by 6%. No wonder, then, that Diageo chief executive Ivan Menezes is ‘particularly proud’ of Johnnie Walker’s recent performance. Menezes is similarly impressed with recent trends for the Buchanan’s blend – ‘Buchanan’s has done beautifully in Latin America and the US,’ he says. Volumes and revenues were both up by 16% last year. In particular, Buchanan’s has chimed with consumers in Latin America, building on this popularity with an increasing presence in the US, exploiting the growth of the Hispanic population there. The numbers don’t lie: revenues up 23% last year in Latin America; up 14% in Mexico; and up 7% in North America. For all the talk of people ‘drinking less but better’ and spending a bit more cash, last year was a good one for some of Diageo’s less expensive – and less heralded – blended Scotch brands. As part of this ‘strategic focus on primary Scotch’, to quote Menezes, there were improving trends for VAT 69, White Horse and (to a lesser extent) Bell’s, but Black & White was the star of the show. Sales up 24% by volume, 16% by value around the world; in Latin America, volumes surging up 46% and value 21%. Double-digit revenue rise in Mexico, out-performing a difficult market in India. 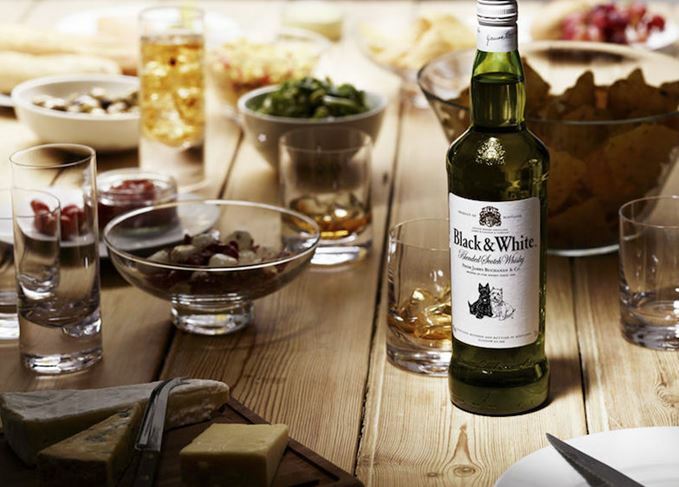 Black & White came into its own in Brazil, where its lower price struck a chord with consumers low on disposable income and no longer willing to splash out on the likes of Johnnie Walker or Buchanan’s. The falling pound allowed the company to offer some highly competitive pricing as well. The broad trends shaping the Scotch whisky market around the world over the past several years have been clear: blends growing slowly or declining, malts on an apparently unstoppable surge. But Diageo’s results show a reversal of that movement, with malts up by only 3% in volume terms, and 2% by value – and blends the driving force behind growth. Menezes expects single malts such as Lagavulin, Oban, Talisker and The Singleton trio to ‘do a lot better’ in the year ahead, but growth for the company’s malts portfolio has been slowing for a couple of years now. It’s worth bearing in mind that, if we disregard The Singleton (which is a combination of three single malts – Dufftown, Glen Ord and Glendullan), the company’s best-selling malt, Talisker, ranks only eighth in the global standings. Has the long-awaited resurgence in China’s Scotch whisky market finally taken hold? After Diageo’s Scotch sales in Greater China dropped 42% in the year to June 2016, this set of results showed a 5% increase, led by the increased popularity of Johnnie Walker and single malts. Until the government-led crackdown on extravagance, China had been all about expensive blends and luxury bottles, but now a more ‘normal’ market has evolved, complete with rapidly growing numbers of cocktail bars and newly-wealthy middle-class consumers. For all the success of the past year, challenges remain for Scotch. In South Korea, people are voting with their wallets and deserting full-strength Scotch for lower-alcohol local alternatives, and the old-style ‘traditional on-trade’ is suffering. Diageo’s Windsor brand’s volumes fell 11% last year, with revenues down 12% and little prospect of improvement. Brazil remains difficult too: Black & White’s success at a low price is a symptom of a market where people are reluctant to spend their hard-earned cash on higher-priced products such as Johnnie Walker. In India, Diageo’s Scotch whisky sales were 6% higher, which sounds positive, but represents a disappointing performance. A ban on alcohol sales at certain outlets near state highways led to the company taking ‘a big hit’ in April to June this year, says Menezes. Diageo will continue the suspension of its Scotch expansion plans after sales fell by 9%. As rare malts hog the headlines, isn’t it time that less expensive drams got some respect?